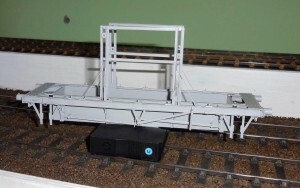 As a small break from loco building I decided to switch to building a MMP LMS/BR 12 Ton Glass Truck. For the simple reason it was advertised as a ScaleSeven kit so I was curious to see what you got. The kit certainly seems fully packed, aside from the two large sheets of etchings there were all the bits for the sprung W-irons, a bag of good quality castings with little or no flash on, plenty of strip wood of various sections to make the glass carrying cases, and even a length of thread for the lashing rope. Just over 2 pages of closely typed instructions and 5 pages of drawings. I find there’s something therapeutic about cutting out etchings and punching lots of half etched rivets, and there are a lot of them! 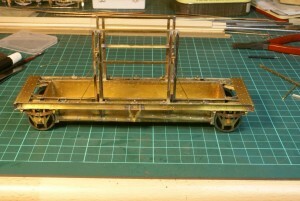 Starting with the main wagon bed, the ends are folded over for the buffer beams. and the solebars need folding and soldering to the main bed. Soldering the folded solebars to the main bed was actually quite tricky, there is a small half etch recess for it to sit in but the strip on the main bed being so thin was prone to buckling slightly. Still just taking it slow and steady ended up with a straight and square main bed. You may have noticed I’ve left a large chunk of etching in the middle. This should be cut out for the drop well to fit. However that would leave some narrow strips in the middle and given my clumsy nature felt sure I would bend them. So I’ll cut the centre bit out when I’m ready to fit the well tanks. There was more riveting to be done and a few end plates to solder in. This being the top side. Even the plates underneath are rivetted. 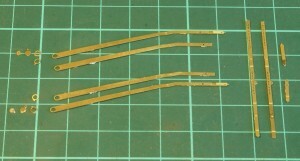 Finally for now the W-irons are soldered in. Next stage is making up all the brackets and leaf springs. 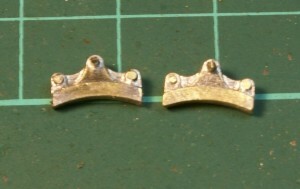 First are the axle boxes, these are quite simple to fold up from the single piece. 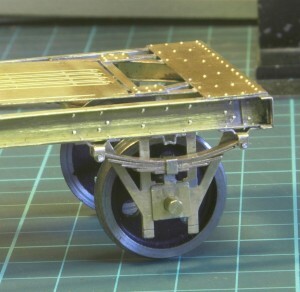 Starting from the left and working to the right shows the various folds required to end up with an axle box complete with pocket for the leaf springs. 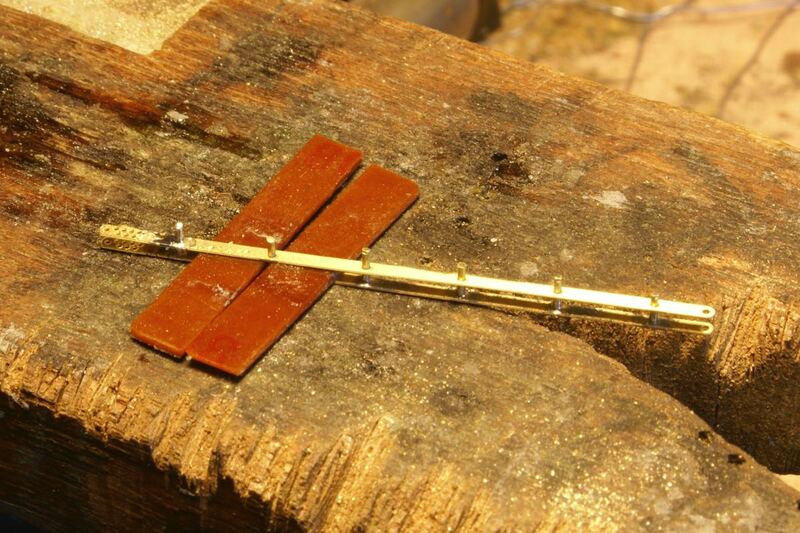 A dab of solder top and bottom holds it all together. 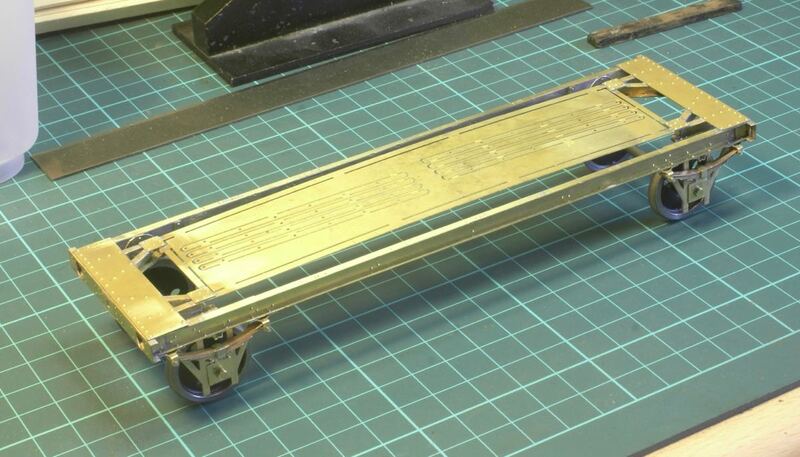 Then it’s the spring hangers and bump stops – and before anyone comments I know there is an odd number, it’s just a couple of spare etchings are included in the fret. So I made them all up so I could select the best ones for the wagon. I did all the folds before punching out the rivets. The spring hangers have a little tab on the rear to locate them into the W irons. We then move onto making the springs. These are a pre-rolled set of phospher-bronze etched leaves and are squeezed into the square pocket at the top of the axlebox. This being the first trial run. For a first fit they seemed a little flat compared to the prototype photos so they were removed and a little more bending was required. A tin of humbrol proved to be about the right size but with the etched hole in the centre it required a little care to bend the leaf to a curve rather than a V shape around the centre hole. Note they are a very tight fit on the pocket, I ended up slotting in the top two and then the bottom two and finally trying to push the 5th leaf in to the middle of the leaves. It also helps with careful cleaning out the pocket to make it square. Being a bit ham-fisted and forcing it too much can result in structural failure! 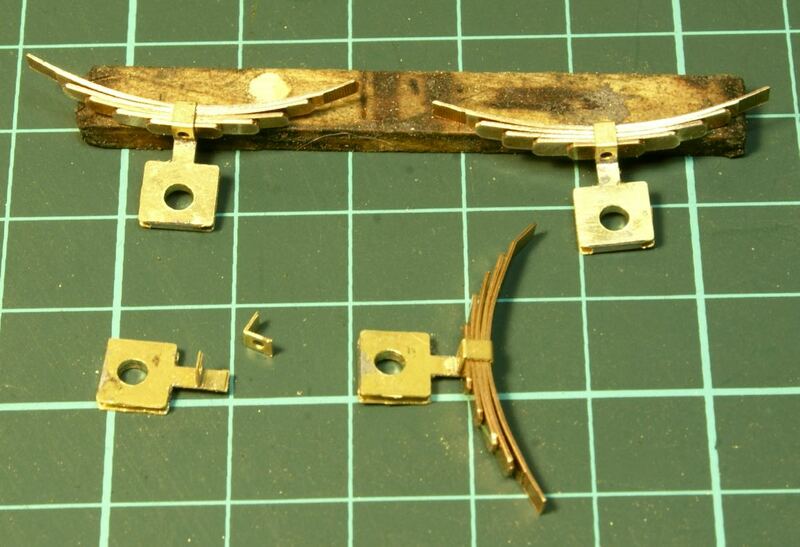 Still threading the leaves on to the brass rod I could solder it back together again. This is where I start deviating from the instructions slightly. 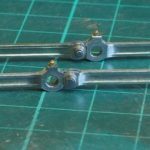 As indicated in Simon’s photo build the instructions say fit the brass rod in the spring hangers and then when fitting the spring to the W iron carefully slide the top leaf first one way and then the other to slide it under the rod in the spring hanger. Well it was tricky enough to fit the top leaf in the first place never mind sliding it one way or the other. So I took a “leaf” out of Simon’s build and fitted the axleboxes to the W-irons before fitting the rod into the spring hanger. 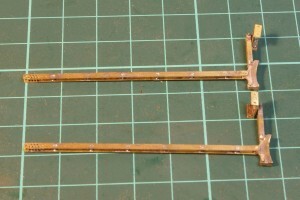 The instructions suggest that once fitted to the W-iron then the end of the top leaf needs to be rolled around the rod in the spring hanger. Trying to get a lever under the top leaf to roll it round the rod was too much for my fat fingers. So my route has been to roll the top leaf loop on the spring out of the wagon. Just using a brass rod it was a lot easier to form the hoop with a pair of pliers. Once done I could fit the spring to the W-iron and then thread the rod through the hanger and spring to hold it in position. At this point I haven’t soldered in the brass bearing bushes either. The kit includes several spacing washers because with the centre well there is no allowable sideslip in the wheelset. Rather than pad out with washers I’m going to solder the bearings in position once the centre well is fitted. Finally there is a keeper plate to be soldered across the bottom of the W-iron, I have deliberately left this off for the moment. 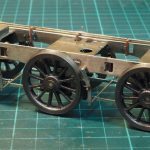 All part of a cunning plan, because the observant may have noticed that the rod for the spring hangers has not been soldered in, so if I remove the pins then I can drop the springs and wheelset out of the wagon. 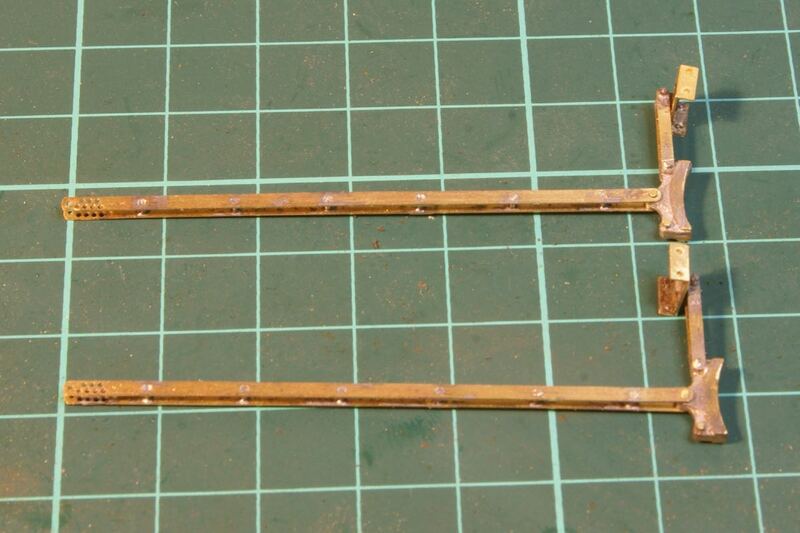 The cunning plan is that this might make it easier for painting later on – hence no keeper plate for the moment. 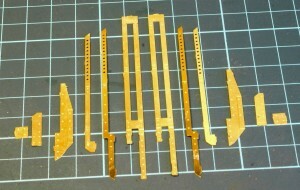 Parts for the centre well. Now we move onto fitting the centre well. This is folded up from a single etching into a box shape, there are half-etched rivets which need punching out and once folded up there are half etched overlay to fit inside the well. On folding it up on the corner joints I wasn’t sure whether the ends should be inside the side pieces or the side pieces inside the ends. The length of the side pieces seemed to suggest that the end plates should be inside the side pieces but this would make the tank wider. So I finally cut out the spare etch in the centre of the well and tack soldered it in position. Once happy it was square and sat correctly I soldered it in along the length. 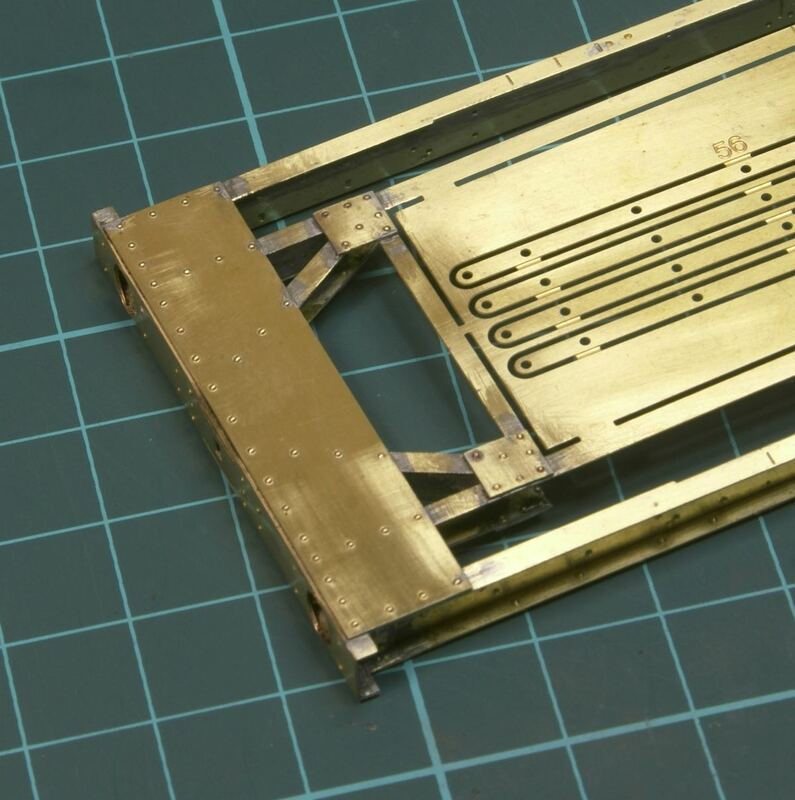 The chassis strip is quite a thin etch along the top of the tank which meant that I had to take it slow and steady to prevent it buckling, but it all seemed to go ok. 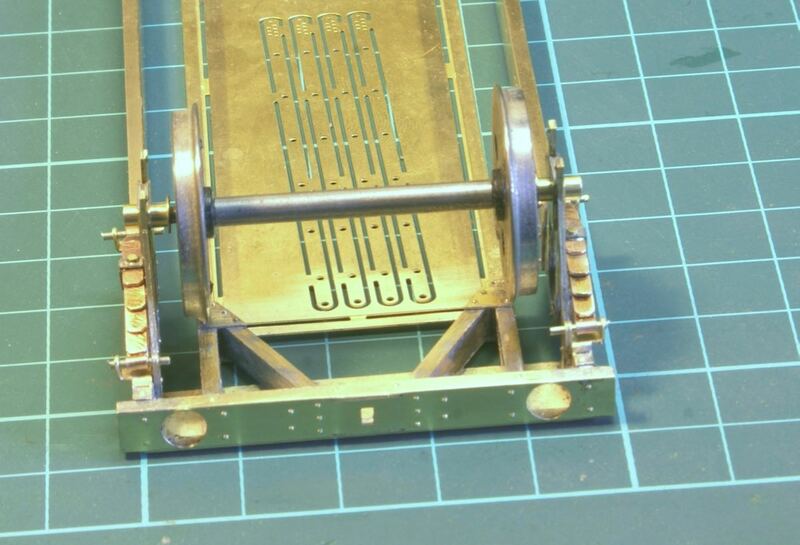 The bearings were moved into position and soldered in to locate the wheels and minimise lateral side-play – the clearance is very tight! 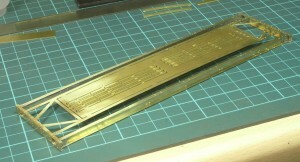 The well tank works out at 30.5mm in width and the Scale7 back to back dimension is 31.3mm. 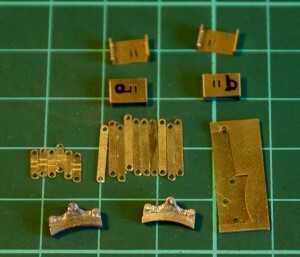 The wheels were then removed and the half etched inners soldered in and then cleaned up. With the well tank in place the instructions then turns to the vertical support brackets, they are handed so first are 2 left hand ones followed by 2 right hand ones. 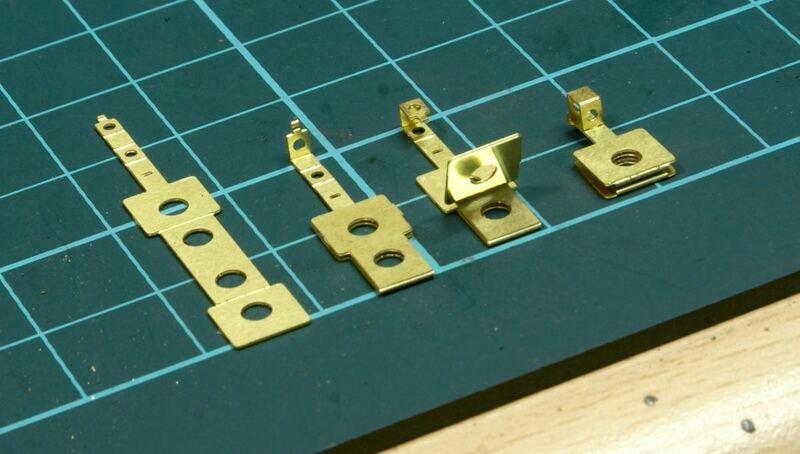 Plenty of rivets to be punched out first, so starting from the centre and working out, the H frames are folded at the bottom to make a step and have a small half etch line along the inner edge to solder in the side plates with multiple holes. 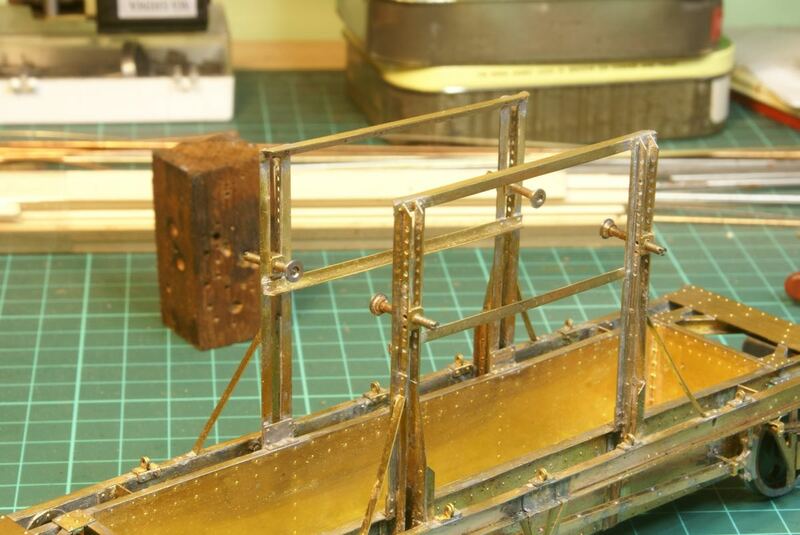 This proved to be quite a tricky job, pressing out the half etched rivets meant that everything had a nice gentle bow in multiple directions. Everything was carefully straightened but holding the side plates in the correct position and at right angles needed a couple of attempts to get it looking right, I resorted to feeding a few lengths of nickel rod through the holes to try and keep everything square. 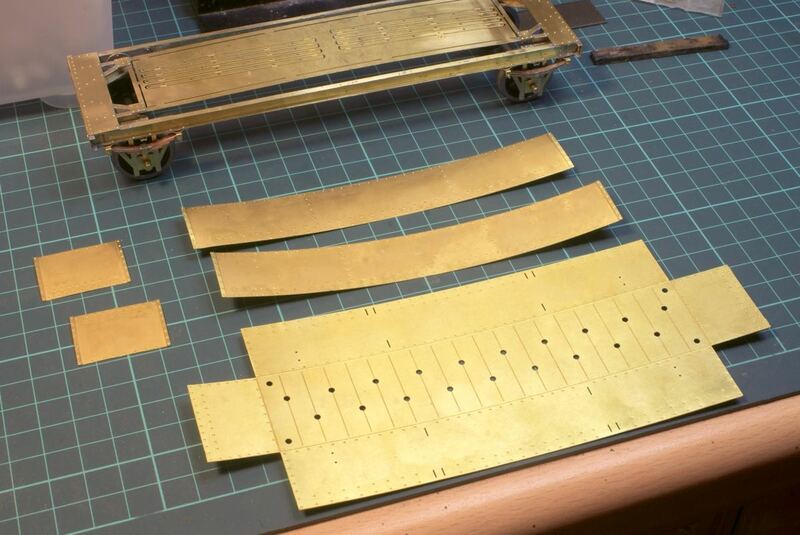 Once that was done the wide plate was soldered in position followed by the outer angle plates. 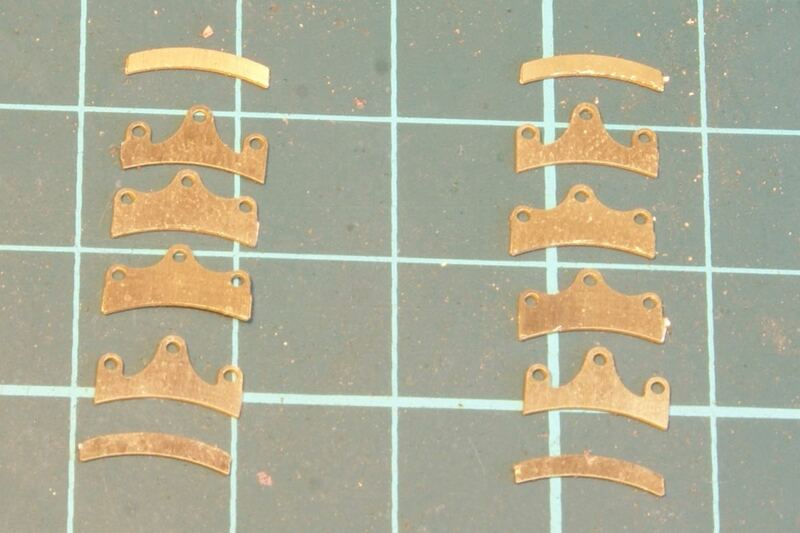 There’s no positive location for the angle plates but there are half etched markings to indicate where they fit so with a little care on the positioning they make up into the units as shown below. Note the tab at the top will be removed, it’s just to hold the vertical angle in position during construction, I’ve folded it down slightly for the photo so that the support sits neatly on the workbench for the photo. Once all four verticals were complete they were soldered to the frame. Half etched guides are on the well which indicate where they should be located. At first I thought I’d done something wrong as the vertical upright when in place on the well didn’t line up correctly with the outside U channel of the frame. However I then realised there was a nice bow on the U channel and a nice straight edge pushed it back into position. 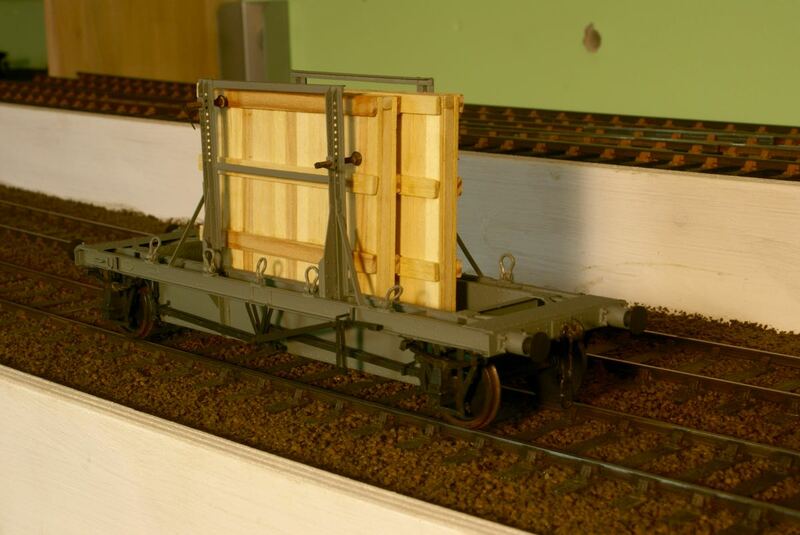 So with the verticals soldered in correctly it does help make the wagon straight and square. Onto the cross pieces between the verticals. These are the next set of etchings to work with. The long pieces are to be folded into an angle and as mentioned in the instructions take care when fitting to get the bevel and orientation correct. From this photo I hope you can see that the half etch fold line and the half etch rivet dimples are on the same side. 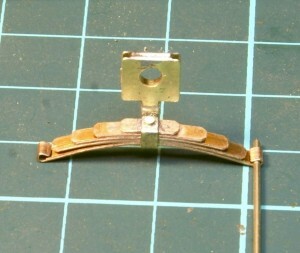 If you fold up this piece with the half etch line on the inside then the rivet is on the wrong side. The rivet needs to be on the inside of the angle, so either fold up with the half etch line on the outside of the angle or do what I did, punch the rivets as intended, fold up with the line on the inside of the angle and then with the rivet tool punch the rivets back through to the inside of the angle. I seem to remember a previous conversation on forming angles – so a photo to show my method. I use a hold an fold to clamp the etch and then a strip of steel bar to push the angle over as much as I can. Then finished off with a rawhide mallet. 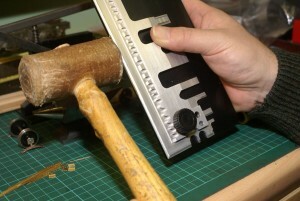 Gentle tapping if required but then the mallet is just rubbed up and down the angle. Giving a nice straight angle piece – note the rivets on the wrong side of the angle. 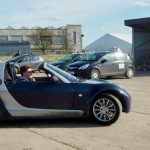 Although having gone to all that trouble on the prototype photos there isn’t a straight piece of angle in sight, they all seem to have been bashed or knocked in some way. So all fitted in place, note the orientation of the angle pieces and the rivets on the inside. 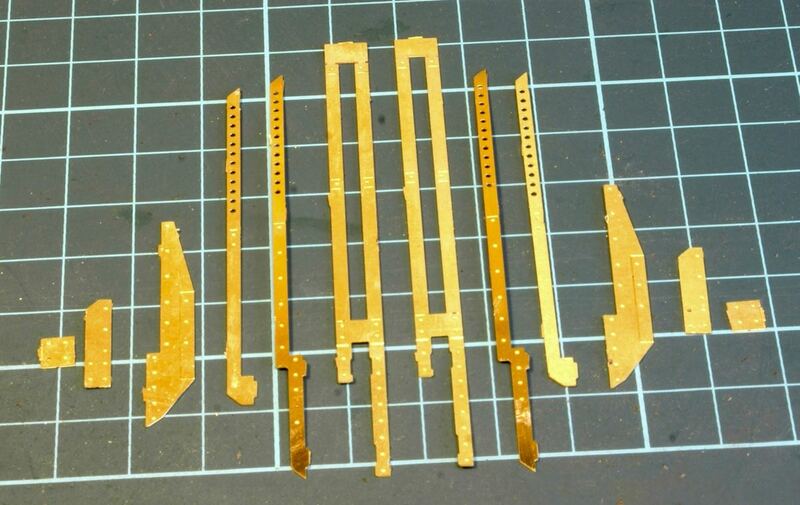 The next task was making up the little brackets for the shackles. Again more etchings that required quite a few folds to get right. 10 in total to make, fortunately there were a couple of spare etches as a few of them ended up looking a little drunk once folded. 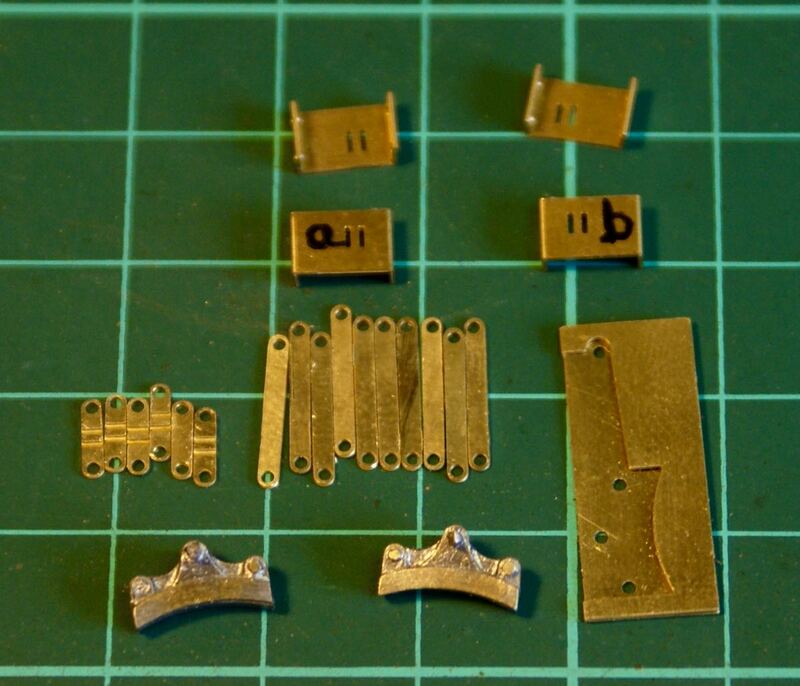 Parts for the brake shoes. 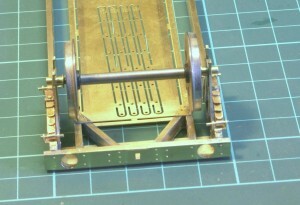 Once fitted the next job was the brake gear, again multiple layers of etchings and bits of wire are required. This is just for 2 brake shoes. 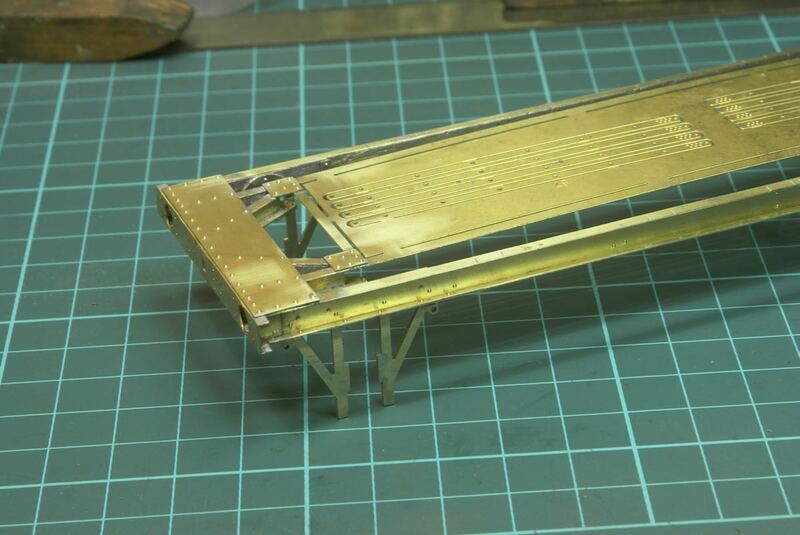 Next it’s the hanger and brackets for the shoes. 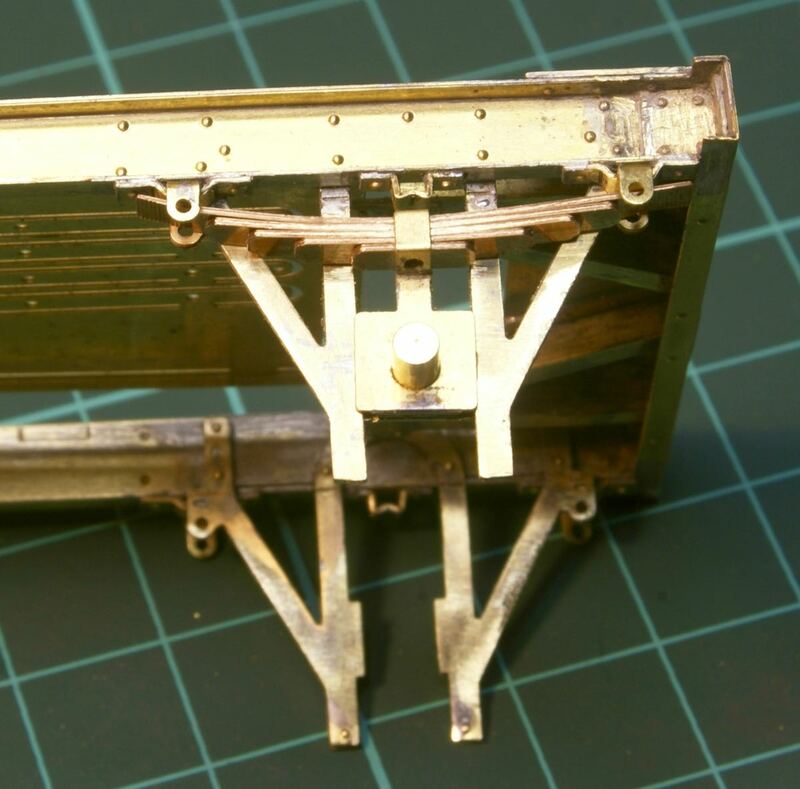 Note the written instructions refer to parts 27 and 28 for the brackets but in the drawing and on the etches they are labelled 27a and 27b. Note they are handed hence making them up. 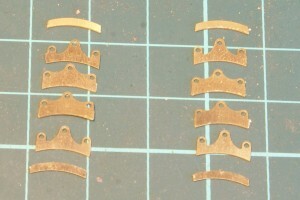 The other etching is for soldering up the hangers in the right place as will be seen below. Once the lefthand pair are complete we then have the righthand set to do. Next up are the bars for the brakes. Using paxolin to space the bars. 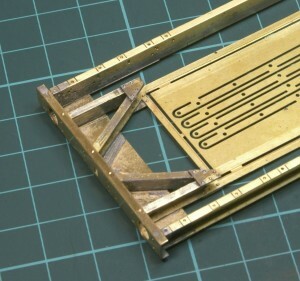 Again more etchings and wire to solder up, I used a couple of pieces of paxolin to keep the spacing even. 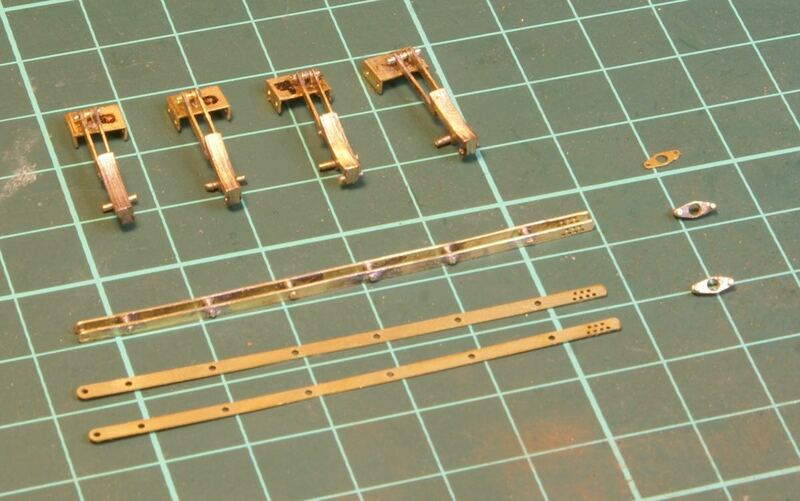 I could then start assembling the various bits. I found that I could ping the brake shoe into the stretcher bar without soldering it. 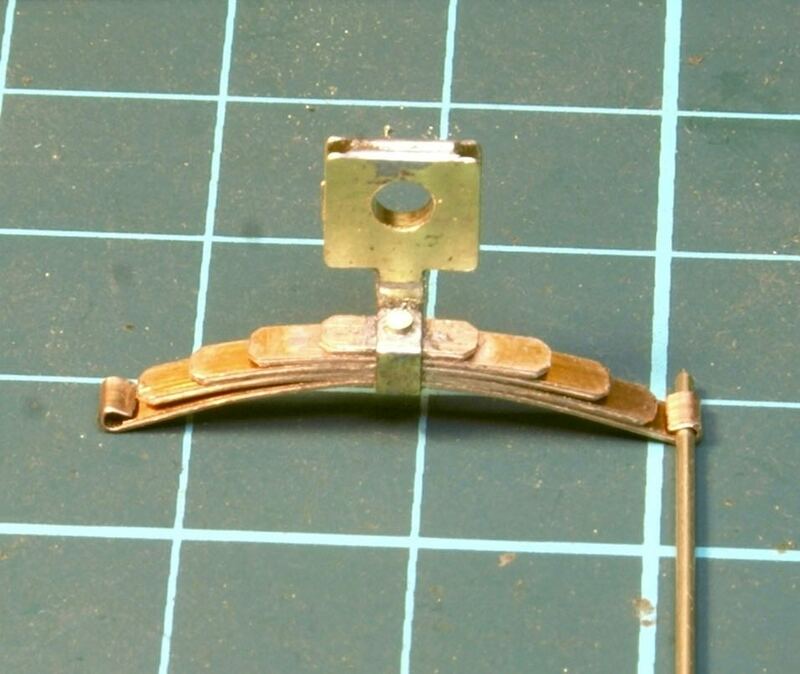 This meant that I could solder the hanger in to the wagon but the brake shoe could be adjusted back and forwards. 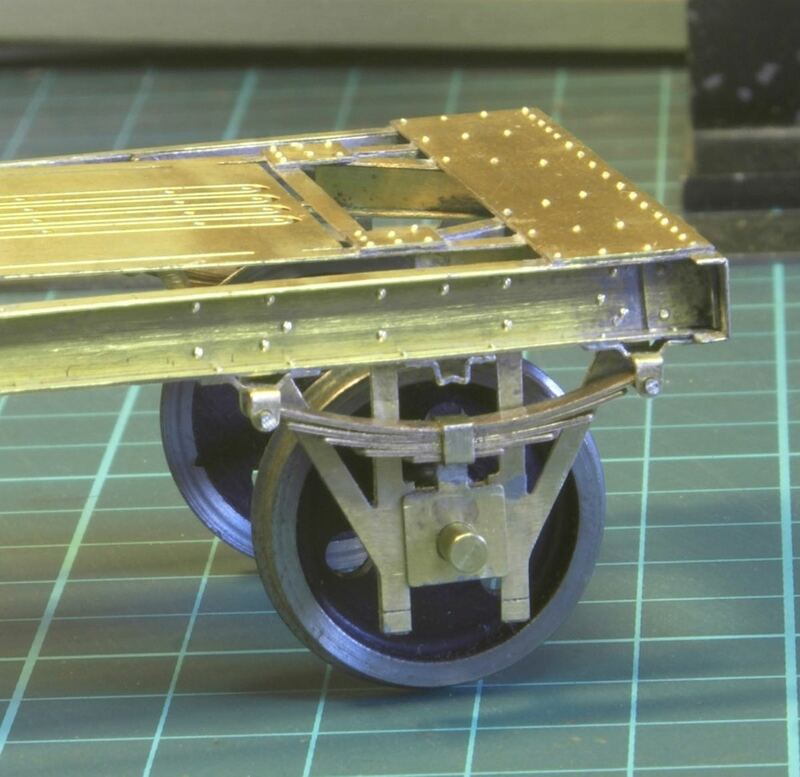 Which was useful as the wheels seemed a little low, I think I’m going to have to adjust the springing to effectively lower the wagon. So left and right brakes are now fitted and still move. It probably wouldn’t be too difficult to make the brakes work with the lever but I think I’ll solder it all up to keep everything in the right position. 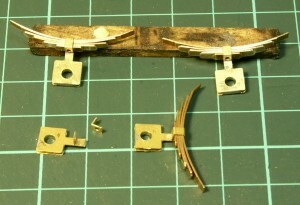 The final image included to show the clamps. 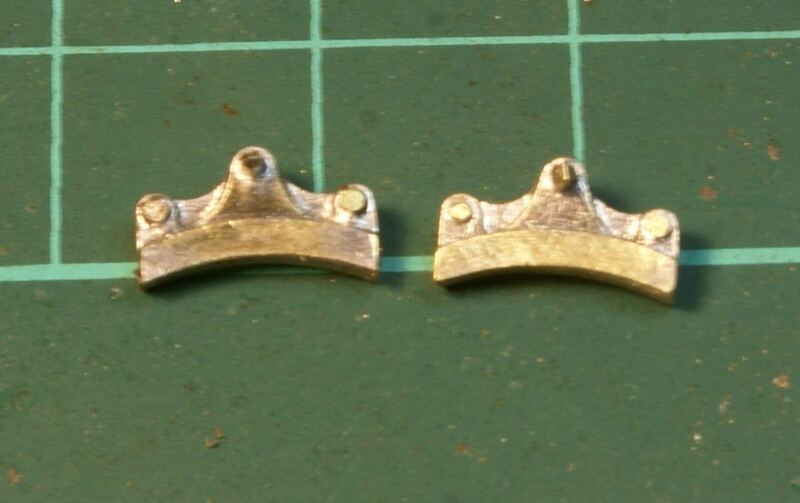 As suggested these will work, they are steel screws with the head thinned down a little and soldered to a steel washer to maker the clamping plate. 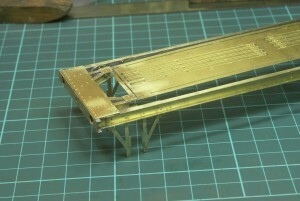 I haven’t soldered the bars in the end as I want them removable at this stage. The whole thing needs a good clean and wash but I’m loathe to get it any where near water at the moment with the Slaters wheels still fitted. I’ll finish adding the last few etchings, strip out the wheels and steels screws before giving it a damn good clean. 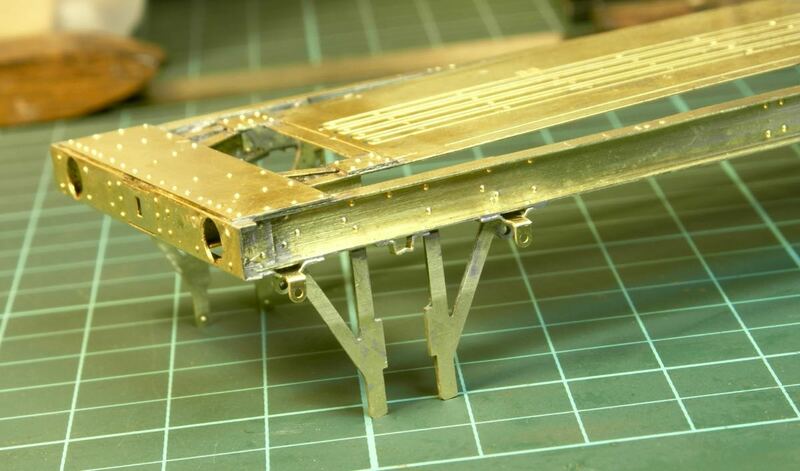 Then it’ll be adding the various whitemetal castings prior to painting. 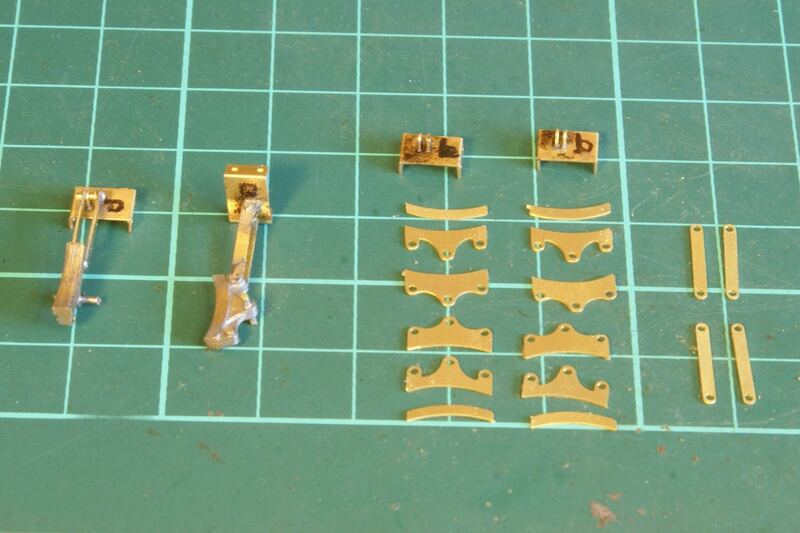 Anyway back to the kit, the brake lever is built up from plenty of etchings. Two are sweated together to give a bit of thickness to the brake lever then there 4 washers to represent the boss and nut on the main pivot. They were very thin etchings and I bent quite a few separating them from the etched sheet. 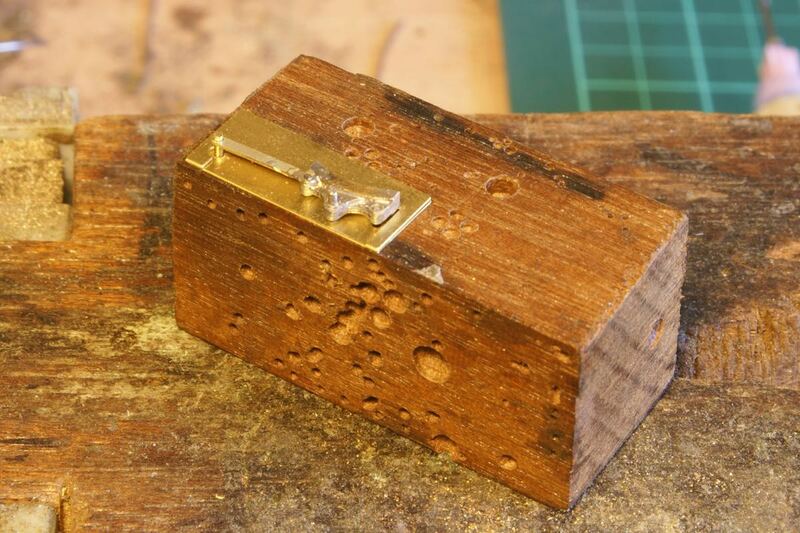 A little tap on a block of wood soon straightened them out. So I’ve just finished adding all the rest of the etched detail. Etched builders plates, clips etc. There was also a small hand rail to be added above the lefthand W iron. These were apparently fitted on the LMS version but not the BR version so there are no markings on the etchings for a drilling guide. 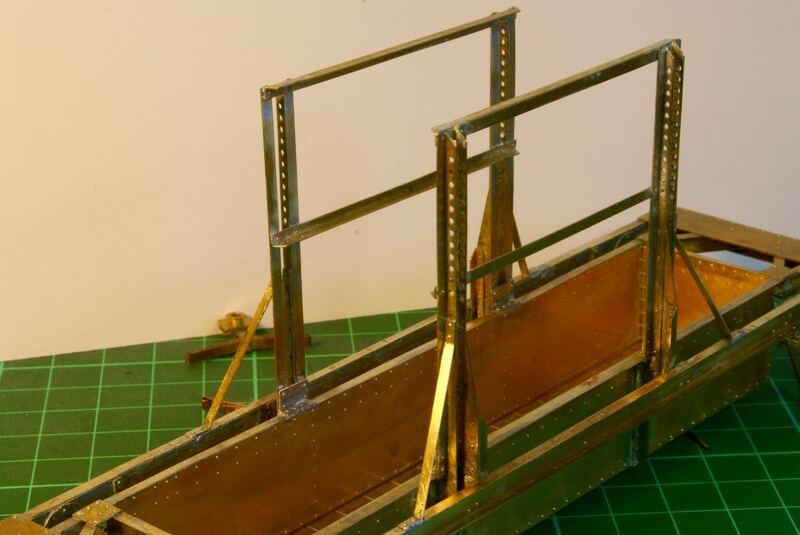 There are a couple of rivets close by and so I pop-marked just to the inside of these to drill the holes so that the rivets represent the clamping bolts for the handrail. 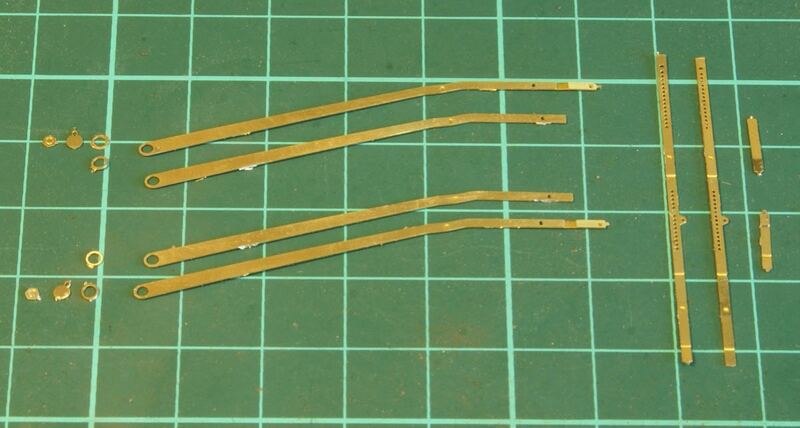 I suspect for the BR version these half etched rivets should not be punched through. 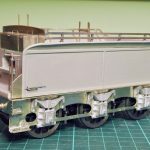 The wheels and axle boxes have been removed as there are no more etched details to add and it needed a damn good clean up. I didn’t want to get the wheels anywhere near any water for fear of watching them rust in front of my eyes. The wheels have been polished and blackened with Casey’s fluid. 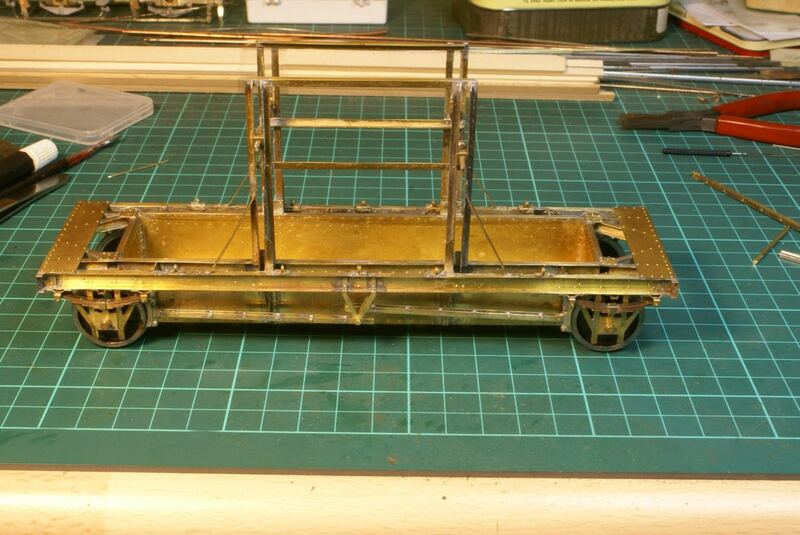 Once cleaned up there are a couple of whitemetal fittings to go on, axle boxes, buffer stocks and lashing eyelets and then it needs a lick of paint before adding all the wood details. The buffers were added but I decided to hold fire on fitting all the lashing hoops. I thought they would get all clogged up with paint if I sprayed the wagon with them fitted. So I’ll paint them separately and fit later. 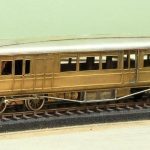 The wagon was cleaned, although at times it felt like that the brass was tarnishing faster than I could clean it with all the nooks and crannies. After a good scrub with the barkeepers friend and drying out on the radiator which helps to warm up the brass I added the first coat of grey primer. 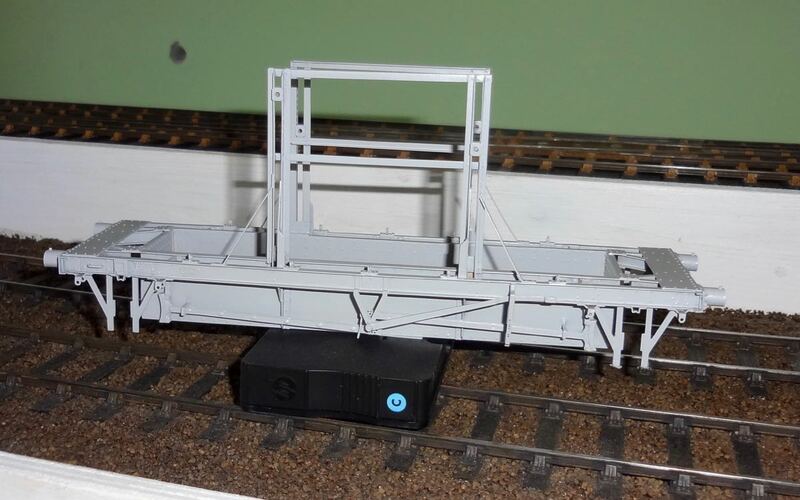 It took two or three goes as the well tank was quite awkward to paint without getting too much on the surrounding frames, followed by rail match grey for a top coat. 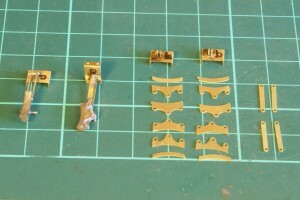 The brake gear, W irons etc. were then picked out with black. Painting complete and packing cases made. 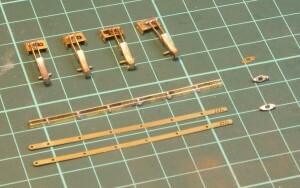 The remaining detailing was then assembled, wheels, buffers, couplings etc. Despite the tight clearances from the back of the wheels to the well tank it does actually roll quite nicely – nothing seems to be catching anyway. It was then chopping and gluing lots of strip wood to make the couple of packing cases. The supplied etched sheet has a few cutting guides included so it was a simple task with a piercing saw to cut the required lengths, a little wood glue to stick them all together. 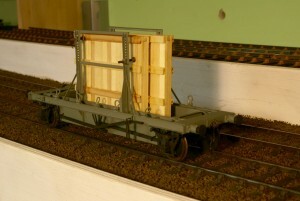 To add a bit of weight to the wagon I included a couple of lengths of steel bar stock inside the wooden cases. The wagon then languished in this state for quite some time whilst I tried to sort out transfers. 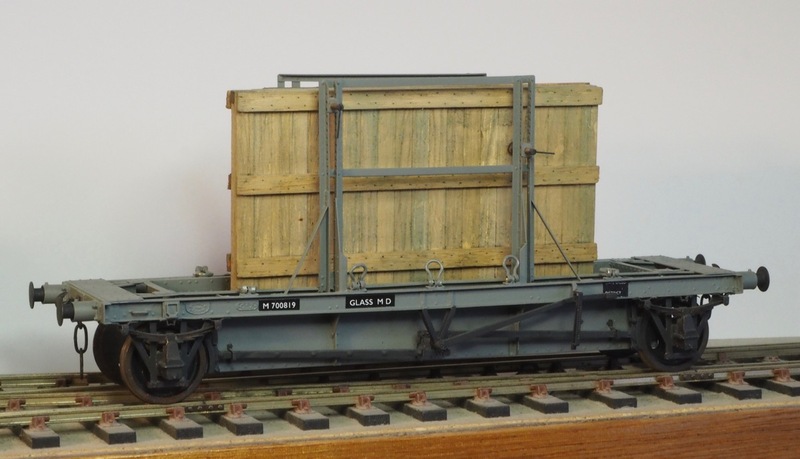 None of the usual suppliers seem to produce transfers for this wagon. So recently I started looking at getting some commissioned, however when I started looking into the design required I thought I would try to make my own. So I bought some transfer paper for the printer and had a go at making my own set. The big problem with making transfers is that standard inkjet printers cannot print in white. However as the transfers I needed were for white lettering on a black panel I decided to experiment by printing the black panel onto white waterslide transfer paper. Once I’d sorted out the required font size it worked remarkably well, enough for me to be happy to fit them to the wagon. The only thing that needed care was applying them, the black pigment didn’t adhere that well to the edges even though I had applied a little lacquer to seal them before cutting out. Careful placement with minimal movement and dabbing with a cotton bud minimised any damage, what little there is will probably be hidden with a bit of weathering.